Social drinking is a term used for people who like to drink alcohol on occasion. A person who drinks socially usually knows his or her limit with alcohol. The day is not consumed with thoughts about drinking or the next drink. 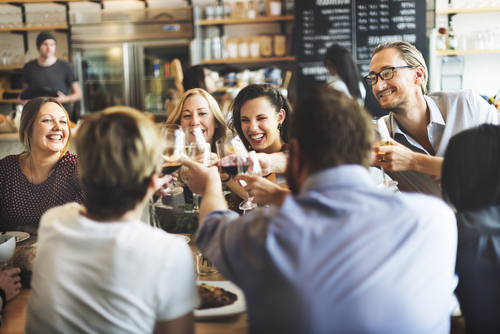 A social drinker is described as a person who drinks with other people at social gatherings, during special events, holidays, or activities. Social drinking can become a problem. It puts a person at high risk of developing an addiction to alcohol. When a person develops alcoholism, he or she loses the ability to stop drinking. Alcohol takes over the brain’s control and causes a physical chemical dependency. Sometimes, people who suffer with alcoholism continue drinking and experience an alcohol-induced black out. Many people who think they are social drinkers are actually high-functioning alcoholics. Alcohol abuse causes serious physical and mental health problems. Alcohol causes brain damage and affects the brain’s normal activity. The brain controls a person’s vision, speech, critical thinking skills, body movement, and organs. Alcohol interrupts the brain’s neurotransmitters, which act as a line of communication for the body to function. Alcohol affects the body’s organs and can lead to liver failure, heart disease, cardiac arrest, and high blood pressure. The term, social drinking, can give a false perception of a person’s alcohol addiction. People with alcoholism may not realize their drinking is a problem. Different factors can determine a person’s risk of alcoholism such as his or her physical condition, mental health issues, and genetics. Alcohol is a depressant and can inflate mental health conditions, such as depression, anxiety, ADHD, and PTSD. People who have an addiction to alcohol are usually in denial about their problematic drinking. An addiction to alcohol ruins relationships, causes harmful effects on the body, and can be fatal. Alcoholism affects the brain and causes brain damage and memory loss. There is help for people who have an addiction to alcohol. Getting treatment for alcoholism will help reveal the reason for a person’s alcohol abuse. Just because social drinking sounds less harmful does not mean drinking alcohol is safe.